This week in the Democratic Republic of Congo (DRC), thirty community leaders and field researchers from the villages of the Inga Valley met to consider their fate in view of the planned Inga3 project that proposes to inundate their communities. Organized locally by Association Droit et Developpement (ADEV) the communities’ chosen representatives dedicated three days (27–29 April 2016) to learning about their human rights in the context of this development project, as well as the resettlement and rehabilitation policy of the World Bank and International Finance Corporation, which are both implicated in the project. Assisting this effort was Housing and Land Rights Network’s coordinator Joseph Schechla, who lead the program applying the HLRN “Loss Matrix” tool for quantification of values and current assets of both the affected households and the wider communities. The training and capacity-development exercise drew out technical lessons for localizing the tool, as well as identified a range of state obligations corresponding to the reparation of those effected. One of the discoveries and quantification challenges was the treatment and documentation of the losses, costs and damages already endured by community members displaced from the earlier Inga1 and Inga2 projects since the 1950s. While these violations began in the period preceding DRC’s 1977 ratification of the International Covenant of Economic, Social and Cultural Rights (1966) and the UN General Assembly’s adoption of the ratification framework in A/RES/60/147 (2006), those violations remain ongoing—and the losses, costs and damages continue accumulating. That legacy is significant to any analysis of the prospective consequences of Inga3, as it has relegated many families to the category of “landless” persons. Also important is the failure of the serial DRC governments to rectify provide reparations for those victims, including restitution of their assets, resettlement, rehabilitation, compensation for assets not possible to restore and satisfaction with the outcome, as provided in the definition of reparations. The other missing component of reparations that has special consequence in the Inga3 case is the guarantee of nonrepetition. The elusive entitlement hangs heavy over the communities threatened by Inga3. When considering the project’s effect on public values, the community representatives roundly assessed the present legitimacy and credibility of government institutions and their representatives as low. Applying the “Loss Matrix” to their present stage of preparedness, their first round of establishing a baseline of existing values has cataloged livelihoods, cultural assets and material achievements through their own social production. Many of these values are incalculable, but not beyond description. The follow-up steps in applying the Matrix will involve assigning also quantifiable values to their many assets at stake in Inga3. That exercise will accompany a refinement of their demands, negotiation strategy and red lines that may make or break the project as only partly outlined by the DRC government and its potential development partners. The Inga Valley communities and their allies, including ADEV and Congo River Panorama (CORAP), in DRC, Rivers International (South Africa) and HIC-HLRN, are making the best of early timing to defend against the violations that Congo River communities have learnt before, as many other communities in the way of large-scale hydro projects around the globe. Photo on front page: The Grand Inga is expected to provide 40,000 MW of electricity—twice that of the world’s current largest hydroelectric project, China’s Three Gorges Dam. Source: Liberty Voice. 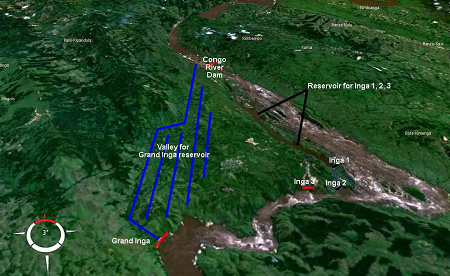 Photo on this page: A digital image of the Inga3 project, diverting the Congo River through the adjacent valley where some 10,000 villagers presently live. Source: Earthzine.